Joshua Reynolds, portrait of a black man, circa 1770.Oil on canvas, 78.7 x 63.7 cm. Houston, Menil Collection, 83-103 DJ. (The Root) — This image is part of a weekly series that The Root is presenting in conjunction with the Image of the Black in Western Art Archive at Harvard University's W.E.B. Du Bois Institute for African and African American Research. 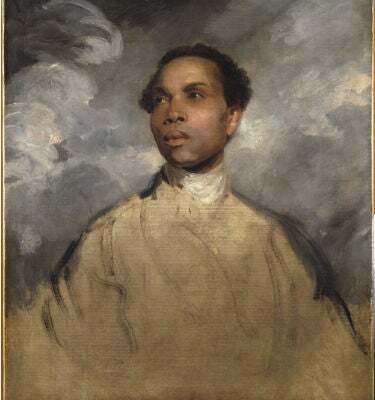 Joshua Reynolds' sensitive depiction of a black man, clearly of an actual sitter, is one of several portraits of blacks, both slave and free, made by British artists in the 18th century. What is most remarkable about this work is the perfect conjoining of superb artistic skill with a truly sympathetic presentation of the subject. A quality of the sublime, typical of the romantic sensibility of the period, is conveyed by the dramatic sky, upward tilt of the head and far-off gaze of the sitter's eyes. Reynolds used the half-length format commonly reserved for well-heeled sitters who could afford his high prices. Its purpose, however, was largely instructional, attested by the numerous copies made of it. The subject traditionally has been identified as Frank Barber, the associate of the famed lexicographer Samuel Johnson, but could just as well be a portrait of Reynolds' own black servant. In any case, it provides a fascinating glimpse into the black world of London during a time when the holding of slaves in Great Britain was increasingly opposed both legally and socially. The celebrated Somerset case, in which Lord Mansfield ruled that a slave could not be forced to leave the country against his will, was decided in 1772, the period in which this portrait was made. The Image of the Black in Western Art Archive resides at Harvard University's W.E.B. Du Bois Institute for African and African American Research. The director of the W.E.B. Du Bois Institute is Henry Louis Gates Jr., who is also The Root's editor-in-chief. The archive and Harvard University Press collaborated to create The Image of the Black in Western Art book series, eight volumes of which were edited by Gates and David Bindman and published by Harvard University Press. Text for each Image of the Week is written by Sheldon Cheek.